Almost 90 years after men’s soccer turned professional in Argentina, the women’s game is still played by amateurs. They make little or no money for their work on the field. Argentina is home to some of the world’s greatest players. But the sport there is still largely seen as a men’s only game. Soccer player Macarena Sanchez drinks "mate" at her home in Buenos Aires, Argentina. Sanchez’s interest in soccer came early. At just five years old she began watching her father play with friends in Santa Fe. The province is the birthplace of famous players like Lionel Messi, Gabriel Batistuta and Jorge Valdano. With her father’s support, Sanchez worked on her own skills at a local club. She improved year by year. Sanchez also competed in three Copa Libertadores tournaments, the main women’s event in South America. She says she spoke about the situation to her sister, a lawyer. After, Sanchez decided to launch her legal action. She is seeking money and the professionalization of women’s soccer. Officials at UAI Urquiza did not give a comment to the AP. And the temporary head of the Argentine federation’s women’s soccer committee could not immediately be reached. Even members of Argentina's national women’s team struggle financially. And a woman player at a top club is usually forced to split her time between soccer and a second job to survive. “There is no possibility, no matter how good a woman is in Argentina today, to make a living from it,” said Brenda Elsey, a professor at Hofstra University in New York. She is an expert on the history of soccer politics in Latin America. “Argentina is not an exception to the rule of gender discrimination in Latin America,” Elsey said. In neighboring Chile, women’s soccer is also amateur. Coaches have protested that men’s clubs with female teams sometimes will not provide them with fields to hold practice. Many top female players from Argentina head to the United States to play in the National Women’s Soccer League (NWSL), where they can earn a living. Brazil, Mexico and Colombia all also have professional women’s leagues. “Some people would shout at us to go wash dishes,” said former soccer player Elba Selva. She scored four goals in Argentina’s 4-1 victory over England at the Azteca Stadium in Mexico City during the 1971 World Cup. “We’re so proud to be a part of this now,” she said. 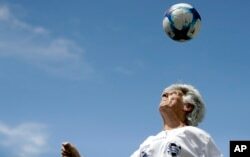 Former goalkeeper Lucila Sandoval founded the group to try to keep the stories of Argentine women’s soccer alive.